The new Jaguar E-Pace Diesel Estate is a stylish and comfortable large family car that can accommodate you and your passengers well. It’s also practical and just as competent as its rival. Competent is the key word here because what the E-Pace doesn’t do is excel in any one area. It is, however, a more compact and less expensive version of the popular F Pace, and that alone will appeal to a certain buyer. OSV takes a closer look at what it’s all about with our 2018 Jaguar E-Pace Diesel Estate review. This might be a Jaguar, but it’s ultimately too heavy to be a performance car. Its sheer size blunts its handling prowess, and it isn’t especially agile. That said, it does engage you and can even be quite entertaining at times. The car is available with both front and four-wheel-drive, and what might disappoint some buyers is that both versions are as agile as each other. That said, the latter version offers more traction and will prove handier in difficult conditions. The steering is well-weighted and responsive, and this helps to build confidence. What will also help to build confidence is the fact that the E-Pace shares its underpinnings with the impressive Range Rover Evoque. The suspension setup, meanwhile, is a major plus and it helps to make the car more enjoyable on winding country roads. 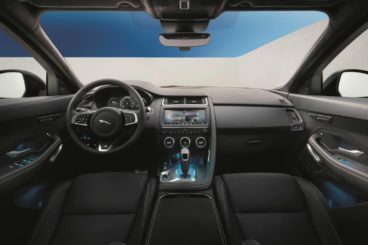 All models come with the JaguarDrive Control system, and this allows you to modify all kinds of things, from the adaptive dampers to the gearbox. In terms of its engines, a 2.0-litre 148bhp diesel kicks things off. It powers the D150 model, has a 0-62 time of 9.5 seconds if you stick to front wheel drive, and comes with a manual ‘box as standard. If you specify four-wheel-drive and the automatic gearbox, that 0-62 time drops to 9.9 seconds. The same engine powers the D180 model but tops you up with an extra 30bhp. It comes with four-wheel drive as standard and completes the 0-62 sprint in just 8.6 seconds if you specify the automatic transmission. It’s our favourite engine and copes well when the whole family is onboard. Rounding off the range is a 237bhp variant of the same engine that powers the D240 model. It comes with four-wheel-drive, 9-speed automatic transmission and has a 0-62 time of 6.8 seconds. That makes it way faster than the D180 model, and the huge surge in speed is down to the addition of another turbocharger. There’s not too much to complain about in regards to the car’s cabin. It’s smartly designed, looks and feels luxurious, and it’s also fairly comfortable. It’s actually styled similarly to the bigger F Pace, which means you get a sloping dashboard and a grab handle on your centre console. However, this one is a tad sportier, although there are also one or two pieces of black plastic here and there, which takes the shine off things somewhat. Still, the mid-range model comes with some fine double-stitched leather that gives the car a deserved sense of occasion. Ride quality could be better, and if you specify the 21” alloys you’d have been in for one heck of a bumpy ride had Jaguar not decided to then hand over the optional adaptive dampers, too (these are mandatory if you specify the 21” alloys but you still have to pay for them). Our biggest criticism of the cabin, however, is the infotainment system. It’s slow, hard to use and not as modern as its rivals. Is the Jaguar E-Pace practical? This is an upmarket car, but it’s also very usable. Four adults will be comfortable on longer trips in here, and headroom is good all-round. Storage solutions are strong and include a gigantic central storage space sandwiched between the two front seats. The boot, meanwhile, measures 577-litres, which is big for this class. Fold the rear seats and it extends to 1,234-litres – which is small for this class. Standard kit is good across the range with the entry-level model getting 17” alloys, a 10” Touch Pro infotainment system, a heated windscreen, a rearview camera, front and rear parking seats and LED headlights. The S trim adds 18” alloys, sat-nav, leather upholstery and electric adjustment for the front seats. Next up is the SE model, whose kit includes 19” alloys and adaptive cruise control, while the HSE model rounds things off with 18-way adjustable front seats, a TFT display and Windsor leather upholstery. Safety wise, the car was put through its crash test paces by Euro NCAP and came away with a 5/5 safety rating. Among its standard safety kit is lane keeping assistance, driver tiredness monitoring and front and rear parking sensors. If you want the likes of adaptive cruise control and blind spot monitoring you will need to upgrade to a higher spec model. In terms of its running costs, it’s well worth bearing in mind that Jaguar is a brand known for producing performance cars. To this end, it seems all the more impressive that the D150 model is able to return as much as 53.3mpg on a good day. Emissions are pegged at 141g/km of CO2, which qualifies the car for a BiK rating of 33%. If you specify four-wheel drive, you’ll see returns of 48.7mpg at best, while the car will emit 153g/km. The bigger D180 model, meanwhile, can manage 48.7mpg too and emits 149g/km. For such a big car, that’s not half bad. Rounding off the range is a D240 model that returns 40.9mpg and emits 175g/km of CO2. This puts it in the highest BiK bracket. Prices start out at just over £28,000 for the entry-level model and the engines are all relatively economical. It’s a beast that looks fantastic. It’s an engaging car on the road that you can have some fun with. The BiK ratings are high. Ride quality clearly wasn’t on Jaguar’s list of priorities. 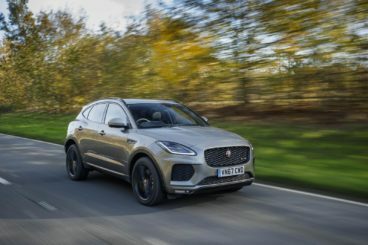 Let’s see how the car fares against its rivals in the comparison section of our 2018 Jaguar E-Pace Diesel Estate review. 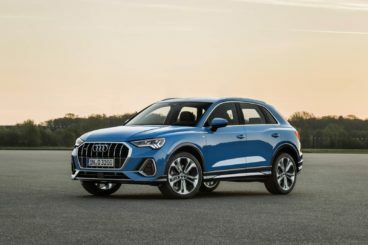 The new Audi Q3 is an upmarket compact large family car that boasts a typically excellent Audi interior. On the road, the Q3 is more fun to drive than the Jag. Front and four-wheel-drive are available, the car resists body lean well and there’s lots of grip. However, while it’s more entertaining than the E-Pace, it’s not as composed on winding roads. Moreover, ride quality is hit and miss but its Quattro system will save the day when the going gets tough. In terms of its engines, there’s only one diesel available. This is a capable 2.0-litre unit that develops 148bhp or 181bhp, the latter of which has a 0-62 time of 7.9 seconds. It’s quiet enough, but it can’t be specified with front-wheel-drive. Running costs? If you stick to the manual gearbox the 181bhp variant can return as much as 53.3mpg on a good day. Specify the automatic ‘box and you’ll manage returns of 54.3mpg economy at best. The smaller 148bhp diesel, meanwhile, is good for 62.8mpg and emits 117g/km of CO2. Inside, the Q3 is impeccable. It’s gorgeous, roomy and one of the best cabins in this market. Soft touch plastics are here, there and everywhere, as are tactile materials. Insulation is excellent, the controls are exquisitely finished, but if we could have but one criticism it’s that this cabin isn’t as cutting edge as some rivals. However, all models come with Bluetooth and sat-nav. Is the Audi Q3 practical? It’s a bit on the small side (it’s roughly the size of a VW Golf), but it’s fairly usable overall. The high roofline helps with headroom, while the big windows make the car feel more spacious. Legroom is good all-round, storage solutions are good and a cooled glovebox is a nice touch. The boot, meanwhile, measures 420-litres, which makes it a lot smaller than the Jaguar. Fold the rear seats, however, and it increases to 1,325-litres – which makes its total capacity bigger than the Jag. The new Volvo XC40 is one of the most stylish Volvo’s there has yet been. It’s also a fantastic all-rounder that boasts sharp steering that’s also well weighted. The car is composed in bends, ride comfort is good, and it should be able to satisfy most families. However, it’s not as engaging as the E-Pace, let alone the Q3. Instead, it offers a fuss-free way for you to get from A to B. In terms of its engines, a D3 148bhp diesel unit kicks things off. It’s got more than enough performance to offer and can be upgraded to four-wheel-drive and an 8-speed automatic ‘box. A 2.0-litre diesel powers the D4 model. It develops 188bhp, has a 0-62 time of 7.9 seconds and feels as fast as those numbers suggest. Running costs? If you stick to the manual ‘box, the D3 diesel can return as much as 58.9mpg. Emissions are pegged at 127g/km of CO2, and this gives it a BiK rating of 30%. Adding bigger alloys causes a dip in economy and see its BiK rating rise to 31%. Add four-wheel-drive and the automatic transmission and economy drops all the way to 52.3mpg. The bigger D4 model also returns 52.3mpg and comes with four-wheel-drive and an automatic gearbox as standard. Inside, Volvo have gone for a relaxed vibe. This is complemented by a stylish design, and the result is a cabin that looks and feels very upmarket. There’s zero clutter on the dashboard, the brands Sensus portrait touchscreen is all present and correct – but we would have liked to have seen more soft-touch plastics on display. 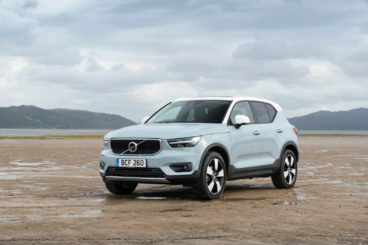 Is the Volvo XC40 practical? In the main, this is what the car is here for but it falls short of rivals. Its boxy shape means that there’s plenty of room available, but it isn’t the biggest car in this class. Still, rear head and legroom is reasonable and four adults should be comfortable enough on longer trips. Five people will find life more difficult thanks to a raised transmission tunnel and cramped shoulder space in the rear. The boot meanwhile, measures 460-litres, which is way down on the E-Pace. Fold the rear seats and you can extend it to 1,336-litres, which is up on the E-Pace. Strong, capable and stylish, this one ticks a lot of boxes. It’s got the premium touches buyers want, it drives well and it’s also remarkably affordable. The new Jaguar E-Pace Diesel Estate faces off against some formidable competition but if you want to buy British, there’s no reason to look elsewhere.